"Thanks, Jay!" That's the message the market collectively sent after Fed Chairman Jay Powell's comments Wednesday. U.S. markets surged higher after Powell said recent rate increases by the Fed had brought rates "just below" neutral, signaling that the pace of rate hikes going forward may not be as quick as some feared. The big S&P 500 Index rallied more than 2% Wednesday on the comments. While Wall Street will surely continue to unpack Powell's comments ad infinitum, the reaction in the broad market likely has a lot more to do with market participants looking for an excuse to start buying again, rather than seeing the comments as a possible about-face from the Fed. Still, the net-effect is the same - we just witnessed the fact that investors are still very willing to pile into stocks in the final stretch of 2018. And that's translating into potential buying opportunities in some of Wall Street's biggest stocks. Case in point: Bank of America (BAC - Get Report) . It stands to reason that any positive comments from the Fed could drive significant upside in Bank of America - as one of the biggest banks in the U.S., BofA is hugely rate-sensitive. But the technical setup in shares has actually been in formation since mid-October. Bank of America has been forming an ascending triangle bottom, a non-typical pattern that indicates growing buying pressure after a selloff. The setup is formed by horizontal resistance at the $29 level and uptrending support to the downside. Simply put, a breakout through $29 opens the door to materially more upside in shares of Bank of America. 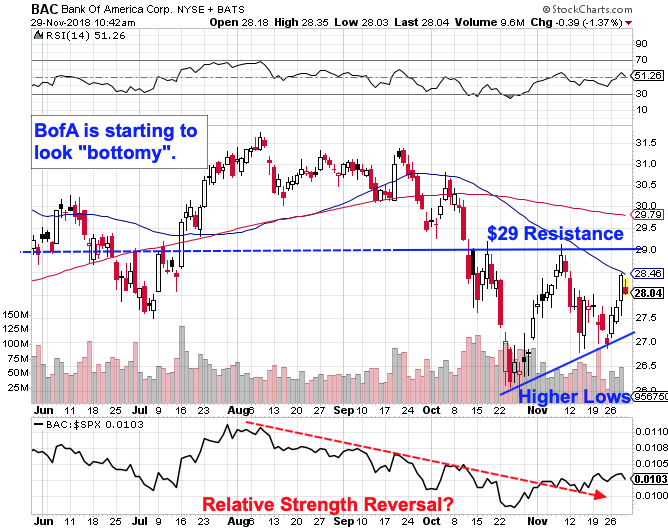 Relative strength adds some extra confidence to the upside potential in BofA right now. After a prolonged stretch of underperforming the broad market since August, BofA started leading the market higher when the calendar flipped to November. That flip in relative strength could signal the start of a more meaningful trend higher in this stock's price action. Risk management remains key. As of right now, early buying pressure in BofA doesn't justify a long position. At least not yet. The glut of supply of shares above $29 has swatted shares lower on the last two attempts through that level. That won't change until increasingly eager buyers absorb that excess overhead supply. We'll know that's happened once shares can catch and hold a bid above $29. A breakout above $29 is a buy signal in Bank of America. On the flipside, a violation of prior lows at $27 is a signal that the bullish price action is busted in this banking giant.